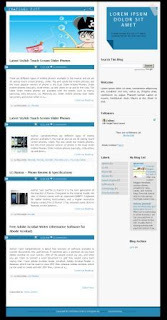 Introducing my new blogger template, Blue Glide Blogger Template. This template has glide feature for image gallery slideshow. Suitable for personal, portfolio, photo blog. Work on major browser including IE. Here's the screenshoot. - Download xml file and save. Click download link above. Remember to Save, no need to open. Anyway is glider = horizontal scroll? The simple glider on the top of this template is the main attraction of this template. I like this template and have also added it to my Blogger Templates list with short review. Hope you like it. Hi, I like this template. I'm on the lookout for a new 3-column template for my blog that's a little bit more widget-friendly and has ongoing support from the designer :) Hope you don't mind some questions along the way, thank you! thank for the template! sorry, how to make a sub menu in my template "http://nadiar29.blogspot.com"
i like your blog. nice postings. Would it be possible to request a variation of this template that has the header of your Reflection template? :) Let me know if it's free or how much that would cost. Thanks very much! Oh cool, thank you so much! I meant, the outside/outline (title, header, tabs, search bar) looks like Reflection, but the inside (blue note, glider, posts, etc.) will stay as Blue Glider :) I plan to use the blue note on the upper right hand side as a space for updates instead of the header, and the header will be same as Reflection. that is greate template...thanks..for sharing with us. Don't rush with the custom template I requested, ok? I'm still not decided on whether or not I'll change my template. But thanks! Meanwhile, I used Blue Glide for a new blog, http://30-dayblogchallenge.com, it looks great. Thanks so much! But it's still the small square. I'd like for the thumbnail to be more of a rectangle so the images don't get distorted on the homepage. @ny minute: i got sick last week hehe, :) sorry... doesnt work? humm... change to 200 and 200.. how? I'll try the 200 x 200 and I'll let you know. Thanks very much for the quick response!! Nope, it doesn't work :p It's still comes out as the 100 x 100 thumbnail. It's okay, I'll just keep it at 100 x 100 :) Thanks!! Can you have a look, please? :) The lines aren't aligned to the blue bar under the post titles, http://nyminutenow.com. Which part of the code should I update? Thanks so much! OH MY GOSH! I'm sorry! The site I meant for you to look at is http://30-dayblogchallenge.com, where I used your Blue Glide template. I'm just so used to typing the name of my blog :p Thank you! Anyway, the text under the titles there aren't aligned. The text is still on the low side (the original is in the middle of the blue ribbon) but it'll work for now. When it's 0, it looks aligned as you can see now at http://30-dayblogchallenge.com. Maybe because I made part of the titles bold that's why the text moved? i grabbed one of your best templates...it took me some time to edit the glide..thank God I did it! 1) How can I change the words "Featured posts" to "Snapshots". Coz I wanted to put som phots there. 2) Since I'm putting photos, I do not want it to have any link. Just description only. What changes should be made to the code? mba koq yang preview postnya gak jalan yah? added relevant and intelligent commentary here though. Thank you! Blue guide magazine so nice and more interesting magazine. Mostly people are very like it in this magazine and entertainment in this magazine. Blue guide Magazine is very well and more interesting Magazine so that can be enjoy it in this Magazine. Mostly people are very like it and enjoy it in this blog. In this blogger so very well and fantastic blogger shared on the site so that can be enjoy it in this blogger.This is nice and more fantastic.